Even as the Maharaj casino ticketing counter continues to dot the captain of Ports jetty in the capital city, the authorities seem to be busy involved in a blame game. After an uproar in social media and a subsequent petition, the authorities seemed to be fighting amongst themselves as to who is responsible for the removal of barricading and the illegal encroachments on the of footpath. 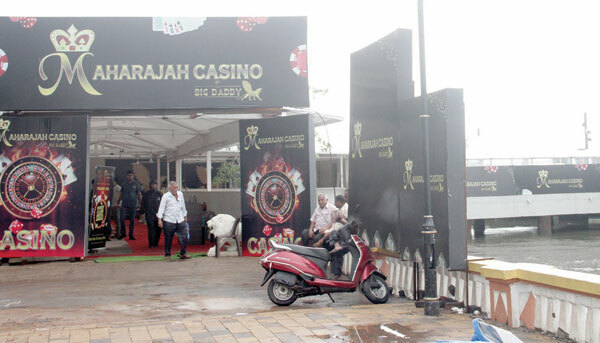 After discussion and debate over the removal of fencing, the Goa State Infrastructure Development Corporation finally removed metal fencing but refused to touch the entry points and ticket counter of the casino. After the uproar, on 30/05/2018, Dy Suptd of Police, Traffic G.P Angle wrote to GSIDC asking for the removal of the encroachment. “The Captain of Ports has said that the fibre sheet fencing erected on the footpath along the D.B.Marg, Panaji has to be retained till such time the non-commenced/non-tendered construction work of terminal building is undertaken by GSIDC,” the letter reads. Further, it says, nearly a year has passed and the fencing near the CoP has not been removed and the pedestrians especially tourists visiting the jetty for a boat cruise are forced to walk on the road endangering their lives. “You are therefore requested to open the footpath for the use of pedestrians and also look into the safety of tourists visiting the jetty,” he says in the letter. Next day, on Capt James Braganza, Captain of Ports also writes to the GSIDC for removal of barricading. “The barricade erected at the time of work Captain of Ports Jetty are still at Panaji are still in place due to further work of construction of New Terminal Building. However, issues are being raised related to the barricaded area. The shifting of the barricade backward of footpath size to enable use by pedestrians, may be examined and considered,” Capt Braganza wrote. Six days later, on 06/06/2018, Srinit Kotwale, MD, GSIDC says he has no jurisdictions on encroachments. “The work for execution of jetty was entrusted to GSIDC by the Captain of Ports after approval of the State government and accordingly the same was executed by GSIDC. In this regard this is submitted that GSIDC had erected said fencing during construction of Jetty at Panaji sometime around October-November 2012 during the execution of said work. Whereas after the completion of work of said jetty, the same is handed over to the Captain of Ports,” he says. However, he continues, the said fencing was not removed considering the GSIDC was yet to execute another project of New Terminal building and avoid financial implication. “Nevertheless the GSIDC has removed the entire fencing/ Moreover the site is not in the possession of GSIDC at present. However, take note that issue of removal of demolition of illegal structures/ encroachment on footpath along D.B.Marg provision of footpath, railings, safety of tourists, illumination facilities, parking, maintenance of cruise timings, security of tourists, allotment of jetty does not come under the purview of GSIDC,” Kotwale states. What is interesting is the CCP which is responsible for removal of illegal encroachments in city limits only calls for an inspection and no action. On June 1, 2018, Ajit Roy, IAS, CCP Commissioner Calls for a joint inspection on 06/06/2018 and the outcome of the inspection is not known as the encroachment on the footpath still stands. 1 All illegal projections/ displays boards/ storage of goods outside shops on streets / footpath will be put to an end. All the municipal councils will advertise by a public notice in newspapers issuing directions to all shop owners to remove all encroachments on municipal footpaths or roads. In case there is non-compliance then the chief officers of councils to act under the powers issued to them under Sub-Section (3) of Section 174 which does not require any notice to be given before taking any action. 2 The Councils or chief officers have no powers to grant licence for permanent structures on road widening and areas which do not form part of public street. If any such licences have been granted they will not be renewed after expiry. Any goods / materials that may be used / kept by the persons shall be seized by the CCP with assistance of police.